This is the fastest ever I’ve organized an exhibition. On last Tuesday I got an email that Eteiskabinetti in Kirjakahvila has no reservation for April. That if I wanted to I could hang my UHANALAISET paintings there. 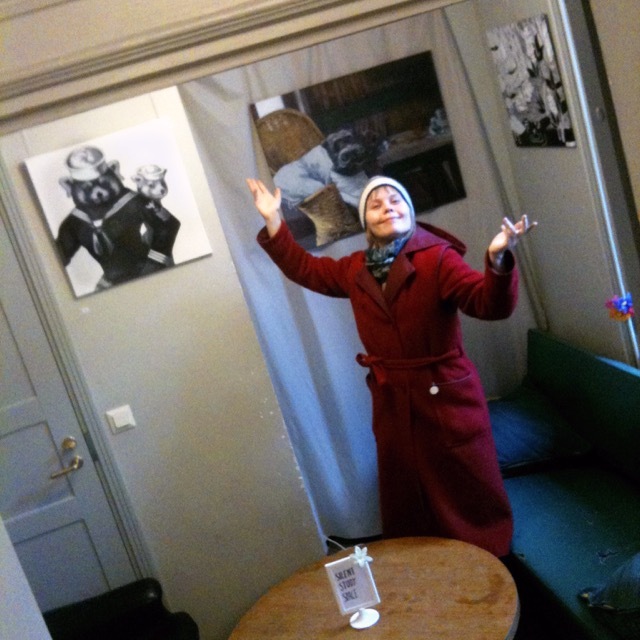 So I did do just that on Friday morning and now the UHANALAISET are in the walls of this small study room in Kirjakahvila until the May Day. The room is located right next to the entrance. Kirjakahvila is a nice cafe in the old centrum of Turku. The area is called Old Great Square. The name of Kirjakahvila means “book cafe” and there are tons of books to be bought or read. They also organize all sorts of events and film screenings. I also recommend their vegan brunch every sunday. And they give discount for students. Jey! Go check out the Uhanalaiset Goes Turku mini exhibition before May. P.S. The paintings are for sale so send me a message elli(at)maanpaa.com if interested on doing some art investements.